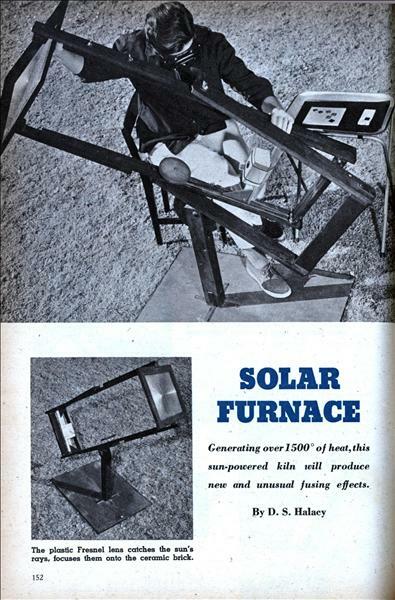 Generating over 1500° of heat, this sun-powered kiln will produce new and unusual fusing effects. By D. S. Halacy ONE of many unusual tasks the sun did at the recent Solar Symposium in Phoenix, Arizona, was the firing of enameled jewelry in a "solar kiln." Far from being a mere stunt, the kiln turned out three hundred blue and gold enameled pins for the officials, and dozens of earrings, cuff-links, necklaces and other jewelry. 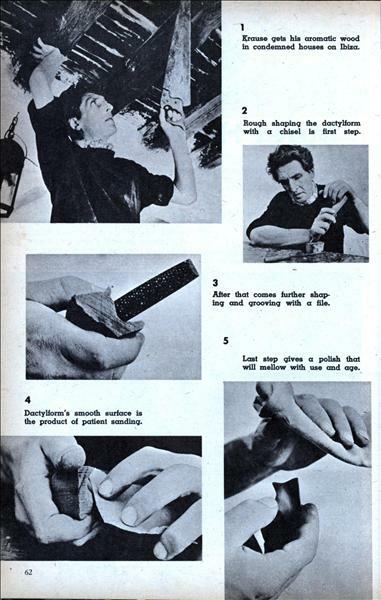 Designed and made by the Phoenix Fine Arts Association, the jewelry, called "Solar Wrought," brought fancy prices as something unique in jewelry. 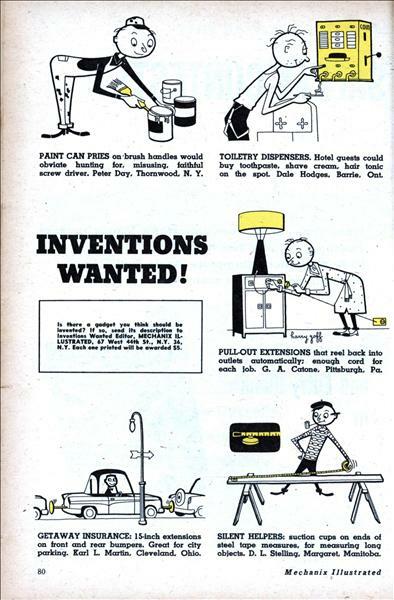 Yet the idea is simple enough that anyone can easily build his own kiln and fire similar items. WORLD'S BIGGEST COPTER hefts 7,800-lb. van. 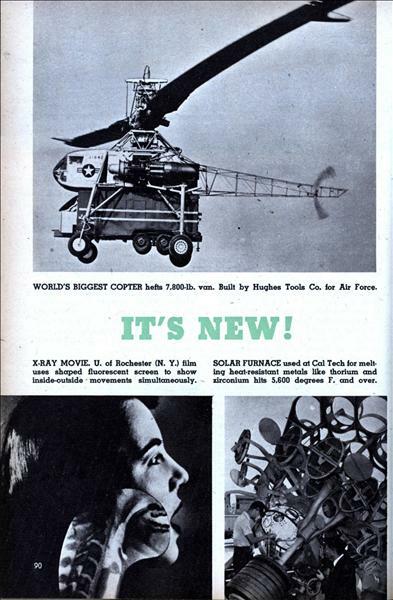 Built by Hughes Tools Co. for Air Force. X-RAY MOVIE. U. of Rochester (N. Y.) film uses shaped fluorescent screen to show inside-outside movements simultaneously. SOLAR FURNACE used at Cal Tech for melting heat-resistant metals like thorium and zirconium hits 5,600 degrees F. and over. 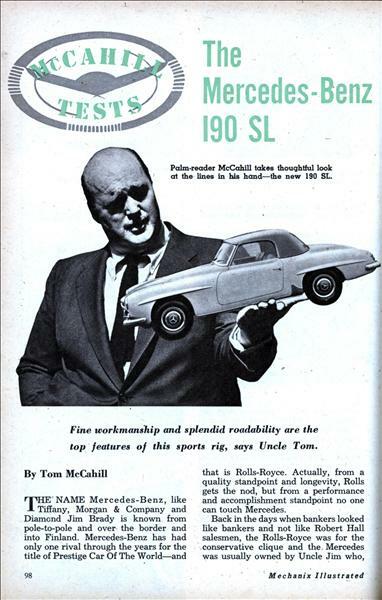 Fine workmanship and splendid roadability are the top features of this sports rig, says Uncle Tom. 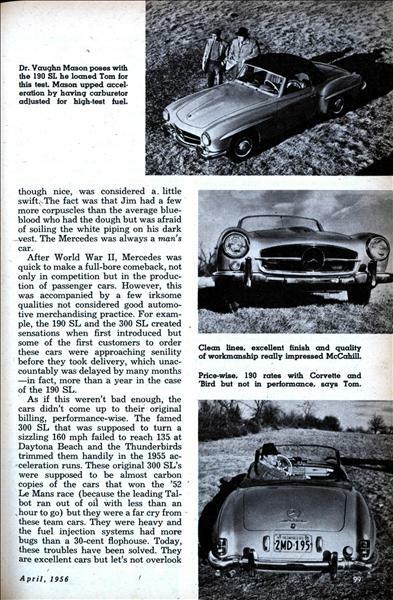 By Tom McCahill THE NAME Mercedes-Benz, like Tiffany, Morgan & Company and Diamond Jim Brady is known from pole-to-pole and over the border and into Finland. Mercedes-Benz has had only one rival through the years for the title of Prestige Car Of The World—and that is Rolls-Royce. Actually, from a quality standpoint and longevity, Rolls gets the nod, but from a performance and accomplishment standpoint no one can touch Mercedes. This 21 "foot dream boat cruises at 50 mph with its triple 25-hp outboard motors and will carry four people comfortably on a sea-going vacation. 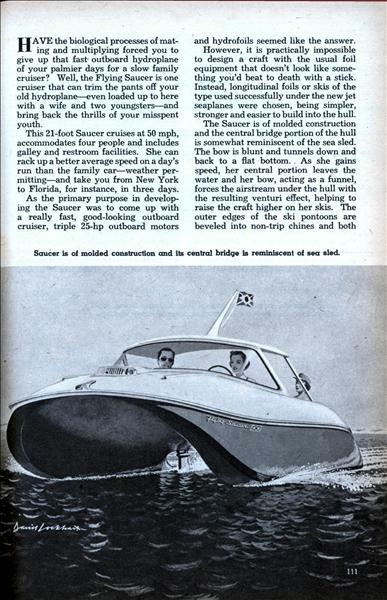 By David Lockhart HAVE the biological processes of mating and multiplying forced you to give up that fast* outboard hydroplane of your palmier days for a slow family cruiser? 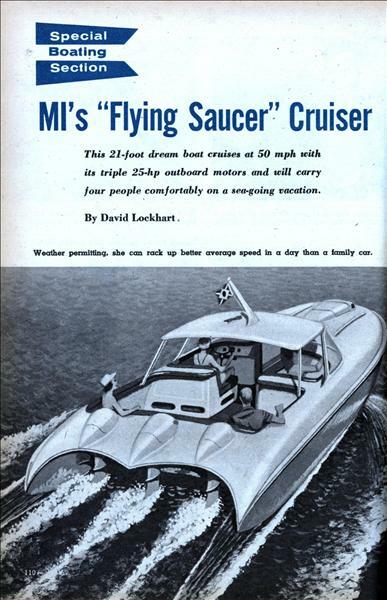 Well, the Flying Saucer is one cruiser that can trim the pants off your old hydroplane—even loaded up to here with a wife and two youngsters—and bring back the thrills of your misspent youth. 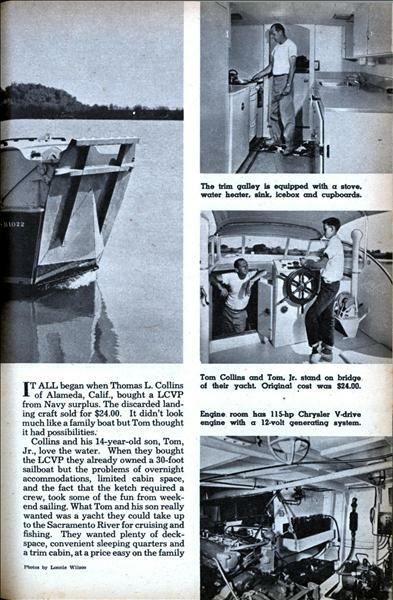 He bought a LCVP from Navy surplus and from it fashioned this nifty "floating cottage." 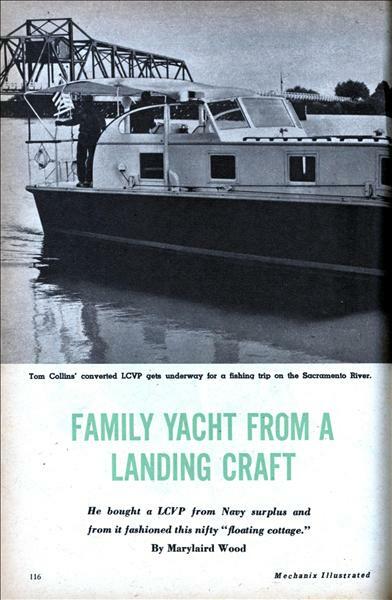 By Marylaird Wood IT ALL began when Thomas L. Collins of Alameda, Calif., bought a LCVP from Navy surplus. The discarded landing craft sold for $24.00. 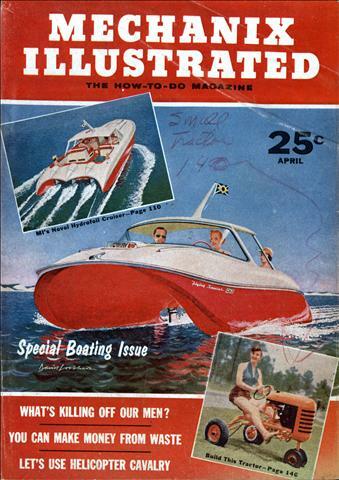 It didn't look much like a family boat but Tom thought it had possibilities. Collins and his 14-year-old son, Tom, Jr., love the water. When they bought the LCVP they already owned a 30-foot sailboat but the problems of overnight accommodations, limited cabin space, and the fact that the ketch required a crew, took some of the fun from weekend sailing. 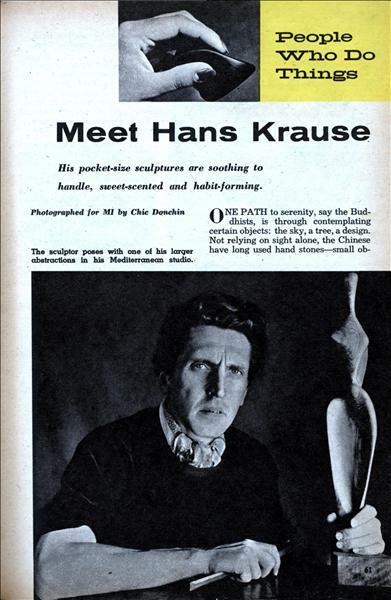 His pocket-size sculptures are soothing to handle, sweet-scented and habit-forming. ONE PATH to serenity, say the Buddhists, is through contemplating certain objects: the sky, a tree, a design. Not relying on sight alone, the Chinese have long used hand stones—small objects combining form and smoothness in a way that makes them delicious to handle. 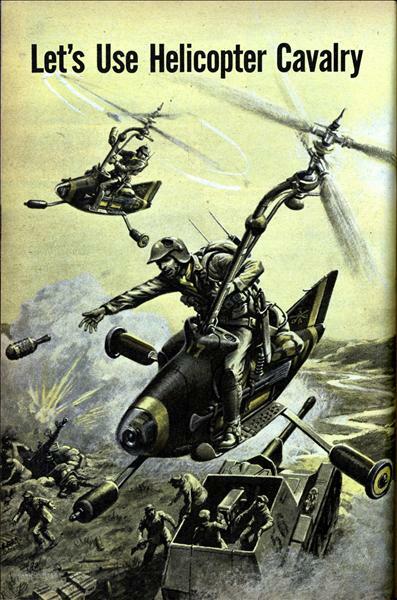 Swooping in suddenly, helitroopers on powerful "sky horses" could wreak havoc with enemy troops. 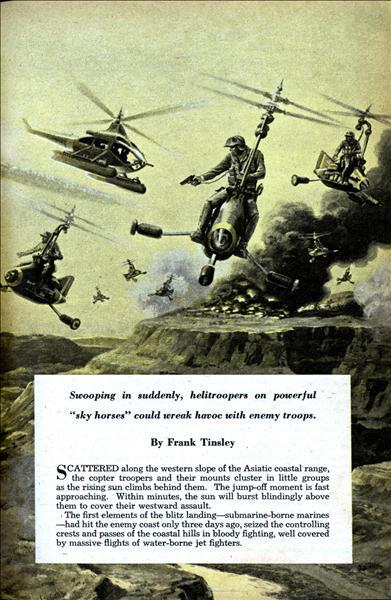 By Frank Tinsley SCATTERED along the western slope of the Asiatic coastal range, the copter troopers and their mounts cluster in little groups as the rising sun climbs behind them. The jump-off moment is fast approaching. Within minutes, the sun will burst blindingly above them to cover their westward assault. The first elements of the blitz landing—submarine-borne marines —had hit the enemy coast only three days ago, seized the controlling crests and passes of the coastal hills in bloody fighting, well covered by massive flights of water-borne jet fighters. 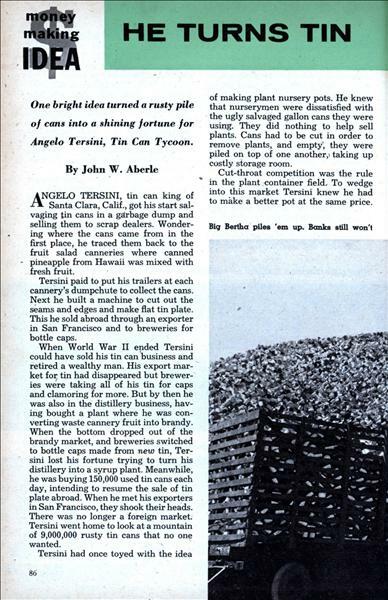 One bright idea turned a rusty pile of cans into a shining fortune for Angelo Tersini, Tin Can Tycoon. 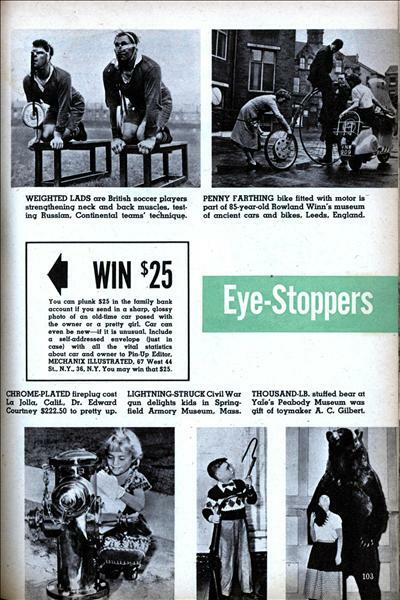 By John W. Aberle ANGELO TERSINI, tin can king of Santa Clara, Calif., got his start salvaging tin cans in a garbage dump and selling them to scrap dealers. Wondering where the cans came from in the first place, he traced them back to the fruit salad canneries where canned pineapple from Hawaii was mixed with fresh fruit. 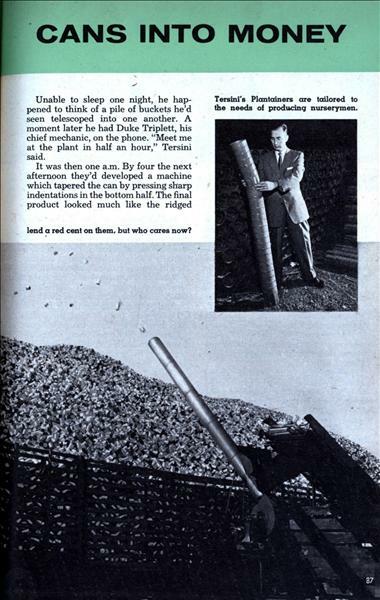 Tersini paid to put his trailers at each cannery's dumpchute to collect the cans. 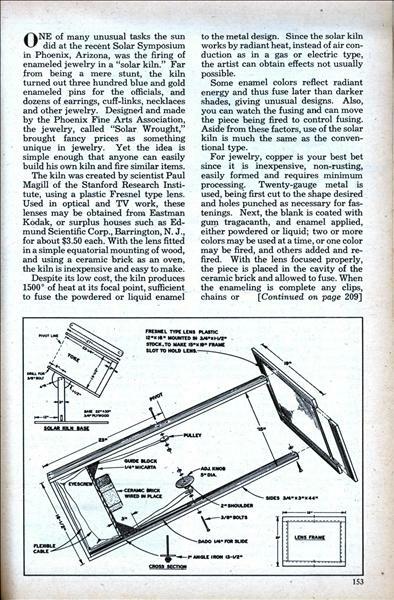 Next he built a machine to cut out the seams and edges and make flat tin plate. 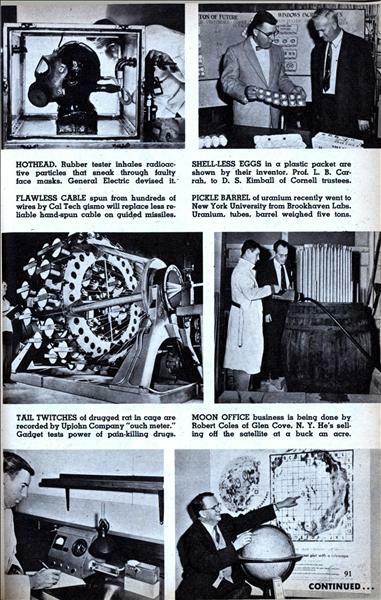 This he sold abroad through an exporter in San Francisco and to breweries for bottle caps. 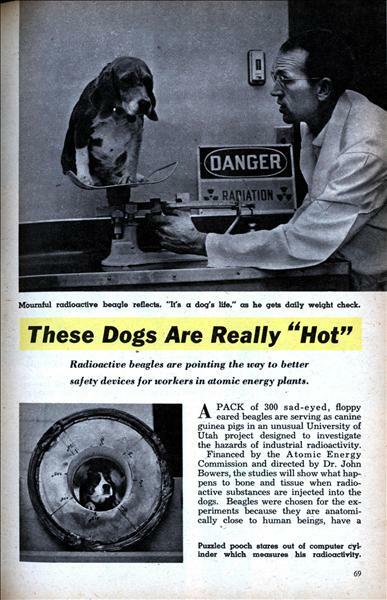 These Dogs Are Really "Hot"
Radioactive beagles are pointing the way to better safety devices for workers in atomic energy plants. A PACK of 300 sad-eyed, floppy eared beagles are serving as canine guinea pigs in an unusual University of Utah project designed to investigate the hazards of industrial radioactivity. 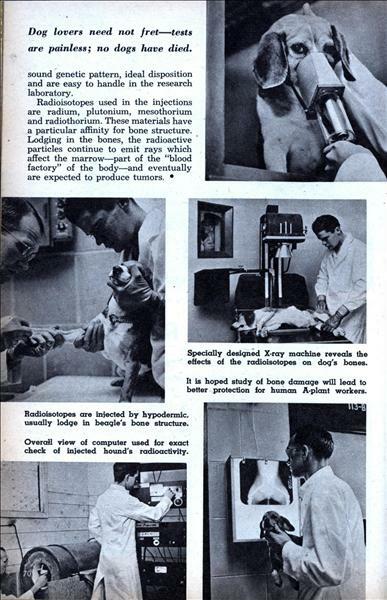 Financed by the Atomic Energy Commission and directed by Dr. John Bowers, the studies will show what happens to bone and tissue when radioactive substances are injected into the dogs. Here are the new autos Russia and satellites are building—Detroit has no cause for alarm. 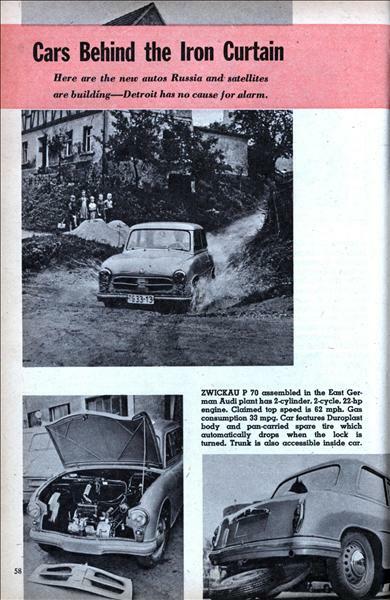 ZWICKAU P 70 assembled in the East German Audi plant has 2-cylinder. 2-cycle, 22-hp engine. 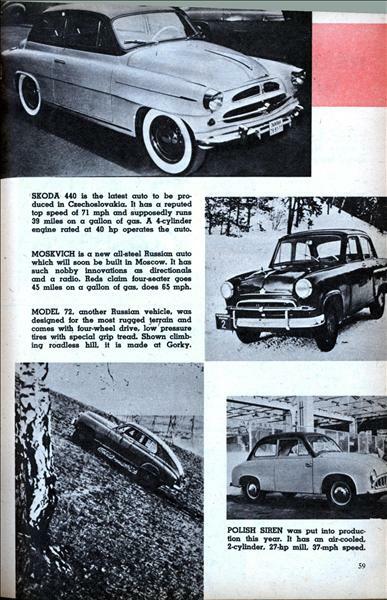 Claimed top speed is 62 mph. Gas consumption 33 mpg. Car features Duroplast body and pan-carried spare tire which automatically drops when the lock is turned. Trunk is also accessible inside car. 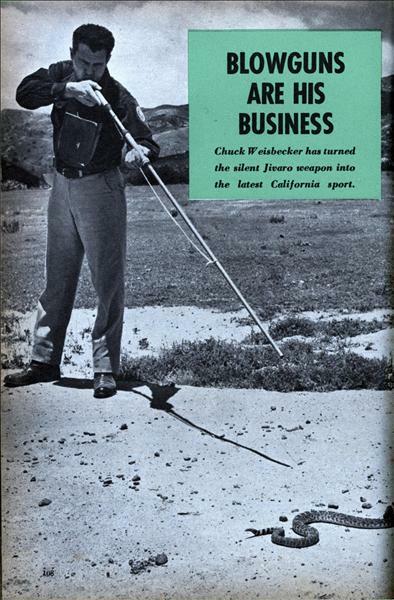 Chuck Weisbecker has turned the silent Jivaro weapon into the latest California sport. 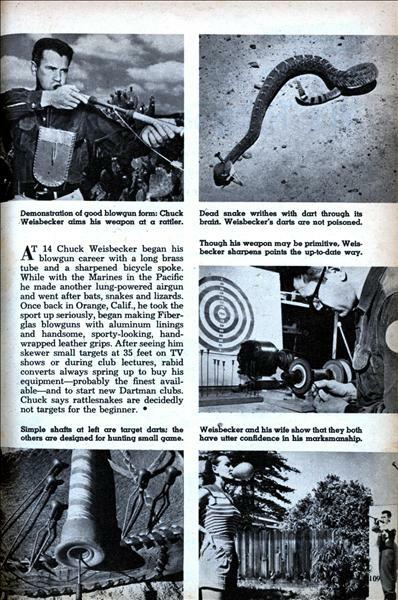 AT 14 Chuck Weisbecker began his blowgun career with a long brass tube and a sharpened bicycle spoke. While with the Marines in the Pacific he made another lung-powered airgun and went after bats, snakes and lizards.